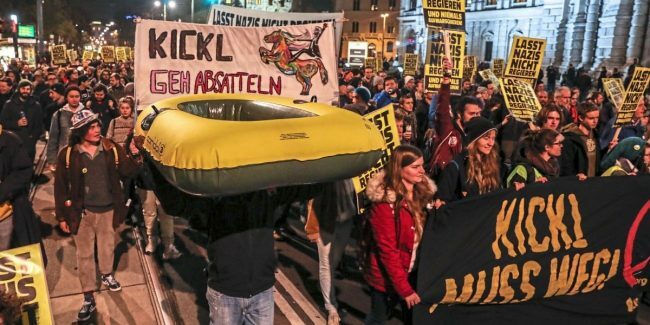 The left-hand turn yesterday drew with a dinghy against Interior Minister Kickl from Schottentor to Vienna’s Minoritenplatz. On Wednesday evening several hundred participants took part in a rally against Minister of the Interior Herbert Kickl (FPÖ) in Vienna. The protest movement organized under the title “Demo gegen Kickl: FPÖ Minister of the Interior off to the Mediterranean!” Led from the “left turn” led from the Schottentor to the Ministry of the Interior at Minoritenplatz. According to police, around 800 demonstrators were on the way, the left turn itself speaks of 1,200 participants. There were no incidents. On Thursday the city is again expected to be crowd attention due to motorists, Vienna city will again be crowded Thursday evening because of demonstrators gathering in the center of city Vienna, heavy traffic jams are to be expected.